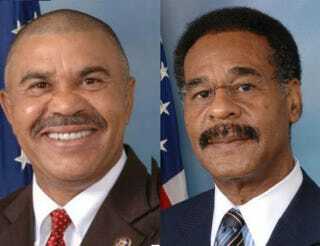 Rep. Lacy Clay (D-Mo. ), whose district includes Ferguson, and Rep. Emanuel Cleaver (D-Mo.) are offering a reward for the capture of the individual or individuals involved in the the shooting of two police officers in Ferguson early Thursday. Clay and Cleaver are offering $3,000 for information leading to the capture of the person or persons. The two police officers were shot early Thursday morning in front of the Ferguson Police Department as a protest was winding down. The shooting took place hours after news that Ferguson Police Chief Thomas Jackson would resign next week. In an interview with The Root, Cleaver said he would work to increase the reward and request help from his colleagues in Congress. “We believe the police serve a mighty significant function in our society. There is absolutely no excuse to do this. We think whoever did it should go to jail. There is no celebration in Missouri at the shooting of two police officers,” Cleaver added. “What happened to Michael Brown, we believe, is wrong, but we believe that it is equally wrong for people to shoot these police officers. Who knows? These might be two of the best police officers on the force on issues of race,” Cleaver told The Root. On Aug. 14, five days after Brown, 18, was shot to death by now-former Ferguson Police Officer Darren Wilson, Clay and Cleaver asked the Department of Justice to investigate the Ferguson Police Department. During a flight with the attorney general on Air Force One last year, the two House members discussed the investigation. Last week, Attorney General Eric Holder announced the results of the investigation in a stunningly detailed and scathing report outlining racial bias in policing and use of fines to extort Ferguson’s African-American residents. In the aftermath of the report, Ferguson Police Capt. Rick Henke and Sgt. William Mudd were fired and Ferguson City Manager John Shaw and Municipal Judge Ron Brockmeyer resigned. On Wednesday, Ferguson Police Chief Jackson announced his resignation effective March 19. He will receive a year’s pay. This week, Cleaver introduced legislation to make it illegal for local municipalities to target communities through fines and fees. Cleaver’s bill, the Fair Justice Act, would make it illegal for police to issue citations for the sole purpose of raising revenue. “The time has come to end the practice of using law enforcement as a cash register,” Cleaver said about the legislation.